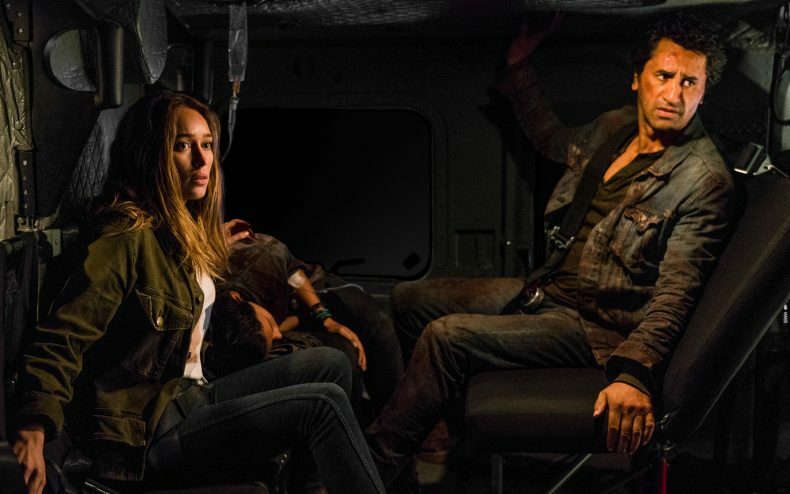 Viewers of Fear The Walking Dead got a big surprise last Sunday when the second of two new episodes appeared to kill off the family patriarch within minutes. As Travis and his daughter-by-marriage Alicia escaped a zombie attack by helicopter, an unknown shooter sprayed the flying vehicle with bullets. Travis, fatally wounded, gave Alicia a look that said “this is it for me, kid” and sealed the deal by jumping right out of the helicopter. But did we actually just see the end of Travis? Popular theories go both ways. POINT: Travis was shot twice: one bullet grazed his neck and the other blew open his stomach. Then he dropped from a ridiculous height. He’s dead unless he’s secretly a vampire. COUNTERPOINT: We are never shown the body, which everyone knows by now is a telltale giveaway that the character a show or movie just “killed off” isn’t dead. No, an actual human being would not be able to survive what just happened to Travis, but this is TV, where people walk away from worse injuries through sheer macho willpower. POINT: iMDB says he returns to the season starting with episode four. COUNTERPOINT: Anyone can edit iMDB and it’s been wrong before. POINT: Travis’s actor, Cliff Curtis, already has a new job lined up: he’s been cast in a yet-to-be-revealed “major role” in James Cameron’s Avatar sequels. COUNTERPOINT: Those are movies, so he should have time in his schedule to commit to a TV series at the same time. POINT: The producers have literally come out and said Travis is dead. Maybe we should have led with this one because it sounds pretty definite. Oh well, too late. 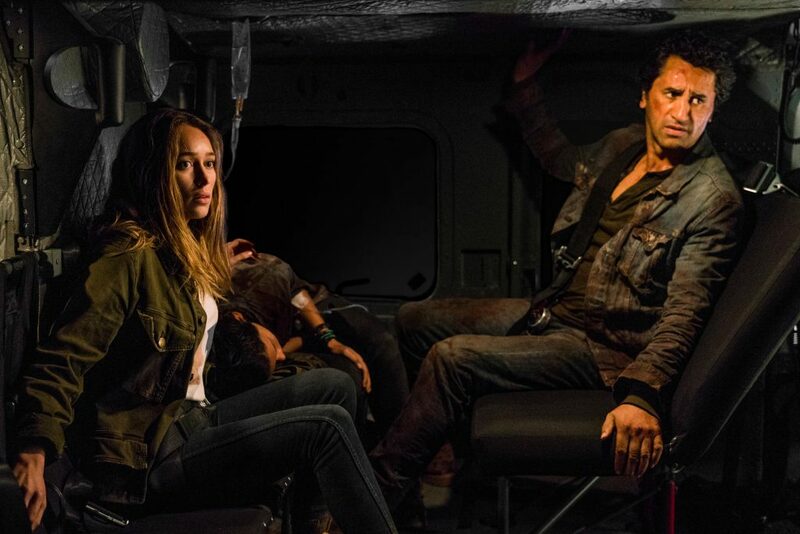 Showrunner Dave Erickson — who also wrote the episode — appeared on Talking Dead after the infamous scene aired and told everyone we had just seen the last of Travis, and special guest Cliff Curtis (his actor) confirmed it. As for why this happened, Erickson said Travis’s story arc, mainly to find and protect his son (who died in the last season finale), was now complete. COUNTERPOINT: On the other hand, we can’t completely trust this one either — It’s not uncommon for producers of other shows to tell lies on the interview circuit to keep bombshell twists from being revealed. What’s your opinion? Personally I won’t believe it until we’re shown a more definite death scene, or Travis as a zombie, or anything that doesn’t allow for a loophole. As it stands it would be rather easy to write Travis’s return into a future script.